Antigenic variation is a hallmark of influenza virus that allows the virus to evade host defenses. Consequently influenza vaccines need to be reformulated frequently to keep up with changing viruses. In contrast, antigenic variation is not a hallmark of poliovirus – the same poliovirus vaccines have been used for nearly 60 years to control infections by this virus. An exception is a poliovirus type 1 that caused a 2010 outbreak in the Republic of Congo. The 2010 outbreak (445 paralytic cases) was unusual because the case fatality ratio of 47% was higher than typically observed (usually less than 10% of patients with confirmed disease die). The first clue that something was different in this outbreak was the finding that sera from some of the fatal cases failed to effectively block (neutralize) infection of cells by the strain of poliovirus isolated during this outbreak (the strain is called PV-RC2010). The same sera effectively neutralized the three Sabin vaccine viruses as well as wild type 1 polioviruses isolated from previous outbreaks. Therefore gaps in vaccination coverage were solely not responsible for this outbreak. Examination of the nucleotide sequence of the genome of type I polioviruses isolated from 12 fatal cases revealed two amino acid changes within a site on surface of the viral capsid that is bound by neutralizing antibodies (illustration). The sequence of this site, called 2a, was changed from ser-ala-ala-leu to pro-ala-asp-leu. This particular combination of amino acid substitutions has never been seen before in poliovirus. 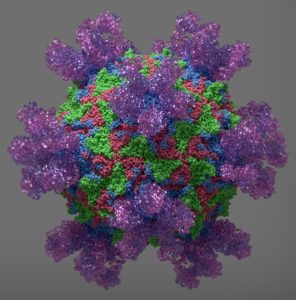 Virus PV-RC2010, which also contains these two amino acid mutations, is completely resistant to neutralization with monoclonal antibodies that recognize antigenic site 2 (monoclonal antibodies recognize a single epitope, as opposed polyclonal antibodies which is a mixture of antibodies that recognize many epitopes. The antibodies in serum are typically polyclonal). Poliovirus neutralization titers were determined using sera from Gabonese and German individuals who had been immunized with Sabin vaccine. These sera effectively neutralized the type I strain of Sabin poliovirus, as well as type 1 polioviruses isolated from recent outbreaks. However the sera had substantially lower neutralization activity against PV-RC2010. From 15-29% of these individuals would be considered not to be protected from infection with this strain. Nucleotide sequence analysis of PV-RC2010 reveals that it is related to a poliovirus strain isolated in Angola in 2009, the year before the Republic of Congo outbreak. The Angolan virus had just one of the two amino acid changes in antigenic site 2a found in PV-RC2010. It is possible that the relative resistance of the polioviruses to antibody neutralization might have been an important contributor to the high virulence observed during the Republic of Congo outbreak. The reduced ability of serum antibodies to neutralize virus would have lead to higher virus in the blood and a greater chance of entering the central nervous system. Another factor could also be that many of the cases of poliomyelitis were in adults, in which the disease is known to be more severe. An important question is whether poliovirus strains such as PV-RC2010 pose a global threat. Typically the fitness of antigenically variant viruses is not the same as wild type, and therefore such viruses are not likely to spread in well immunized populations. Today some parts of the world have incomplete poliovirus immunization coverage, which together with the reduced circulation of wild type polioviruses leads to reduced population immunity. Such a situation could lead to the evolution of antigenic variants. This situation occurred in Finland in 1984, when an outbreak caused by type 3 poliovirus took place. The responsible strains were antigenic variants that evolved due to use of a sub-optimal poliovirus vaccine in that country. The poliovirus outbreaks in the Republic of Congo and Finland were stopped by immunization with poliovirus vaccines, which boosted the population immunity. These experiences show that poliovirus antigenic variants such as PV-RC2010 will not cause outbreaks as long as we continue extensive immunization with poliovirus vaccines, coupled with environmental and clinical testing for the presence of such viruses. Thank you, this was a very timely and important posting! I’m afraid we will see a global resurgence of polio due to ignorance, competition for resources with Ebola etc. and volunteer network that is stretched thin. I thought this paper was bloody horrifying and the world at large should be a hell of a lot more concerned about a high fatality rate vaccine escape mutant of poliovirus than Ebola considering how contagious and environmentally stable enteroviruses are. They’re disgusting little critters – I found quite a lot of papers on what disinfectants don’t kill them while writing the biosafety/disinfectant procedures at my previous job. My mum in law says she remembers what a big deal it was was when polio vaccination became available when she was a kid. Between conspiracy theory antivaxxers in Western countries and poor people in developing countries who have been conned into vaccine denial by religious leaders or politicians, polio outbreaks are already very worrying and this makes it ten times scarier.